Westlund Quits. Quid Pro Quo? Westlund bows out of the race. What did Kulongoski give him to get out? As you’ve got to figure, the only one who stood to lose by having the Tumalo Independent running for governor was Kulongoski’s campaign. What hearts and minds would Westlund have won on the conservative side by championing universal health care? The last time we let someone fool around with health care we got the unsustainable, budget busting Oregon Health Plan, which, as predicted, resulted in rationed health care and giveaways to the politically correct class. Whoo…sign us up! Coyote at NW Republican says he’s ‘heard’ that Westlund will get a sweet job in the Kujo administration–maybe even Secretary of State. All he has to do is change his party affiliation to D. It’s only a formality, of course, Westlund has never been a real R and his switch to I in order to be a stalking horse for Guv Kujo was never very convincing. There’s been much speculation, of course, about “the most partisan Secretary of State in the country” [John Fund, Wall Street Journal on the Victoria Taft Show], Bill “vote by phone” Bradbury, leaving before the end of his term so, as they do with judgeships, the Democrats can name one of their cronies to run as an incumbent in the next election. That Bradbury would bow out, citing health reasons [he suffers from MS] has been the script for some time, Westlund’s bail out gives us a name to plug in to the scenario. Same old. Same old. 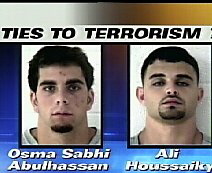 * In addition to the money-laundering charge, the Dearbornistan Terror Boys were charged with Soliciting or Providing Support for an Act of Terrorism. * The Dearbornistan Terror Boys claim that they had the flight manifests and airport security info because the mother of Ali Houssaiky works for Aircraft Services International Group at Detroit Metro Airport.